Today I am going to share a project from a while back that I never got around to sharing. I had lost the pics but just found a couple of them. (I apologize for the lack of pictures in this post.) 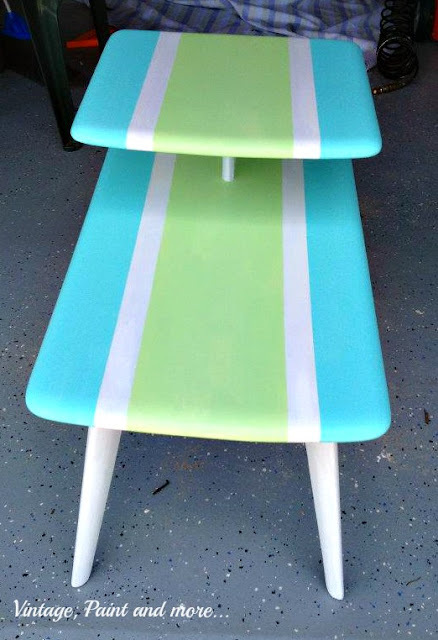 It's what I call the Surfer Table or the Surf Board Inspired Table. It was a table that my son had some fun with and painted to look like a surf board. He used to surf when we lived in Florida and when he saw it at the thrift store said he thought the shape kind of reminded him of an old surfboard. What do you think? Did he call it right? We were out thrift shopping one day and saw this table outside the shop. It had been sitting out there for a while and was quite weathered and in very rough shape. As you can see it has a big stain on the front and is really rough. 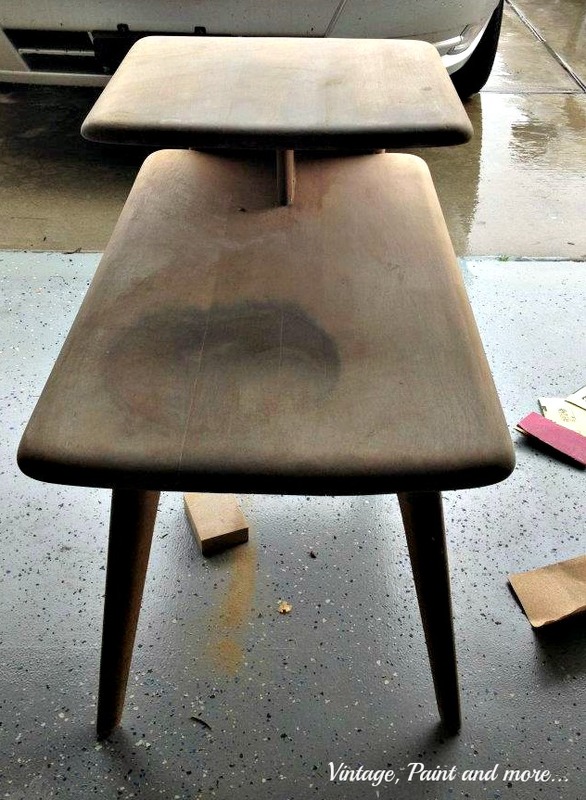 "T" gave it a good sanding first but the stain and the discolorations in the wood were still quite evident. Basically the only save for this table was painting. So after thinking about it for a while he decided to paint it to fit into our teen hangout room in the loft of the home we were living in at the time. 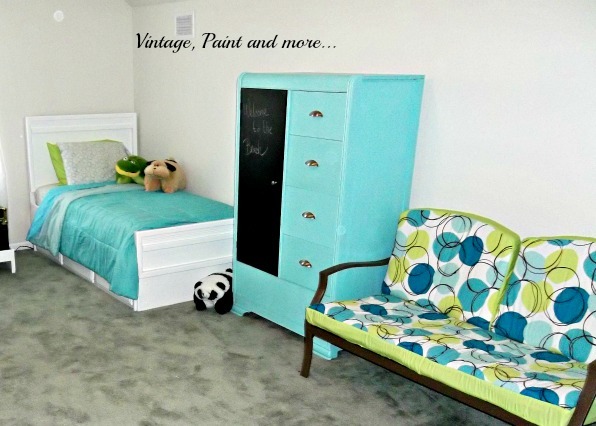 This room was done with our teen grands in mind for when they came to spend the summer months with us. The primary colors we used in this room were Valspar's Sweet Rhapsody and Key Lime. 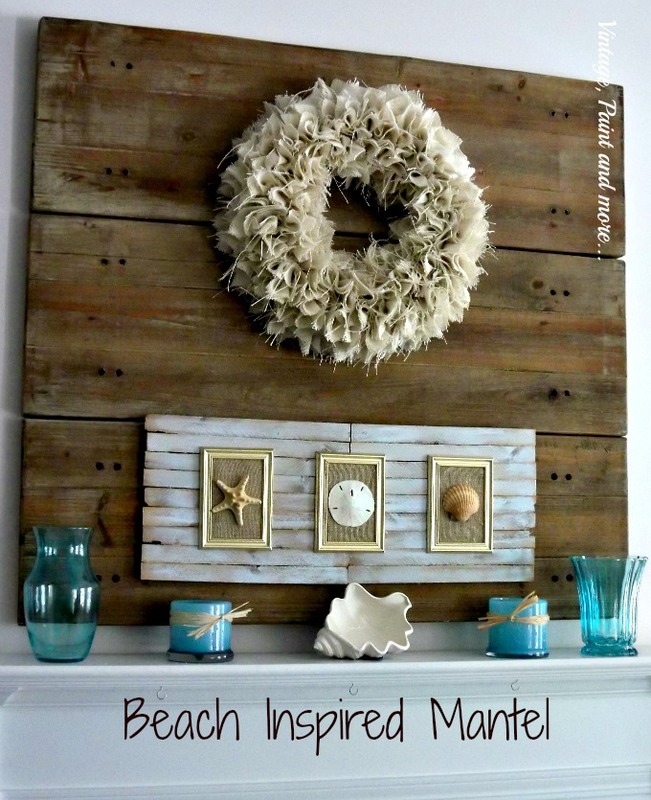 The combination is just so beachy feeling and very upbeat for teenagers. You can see more of it here. So "T" decided to use those two colors on the surfer table. He taped it off with with painter's tape so the stripes were all crisp when it was done. Beautiful! I love this combination of colors. He then waxed it with Johnson's Minwax - 2 coats as it was going in the teen room and... accidents happen. 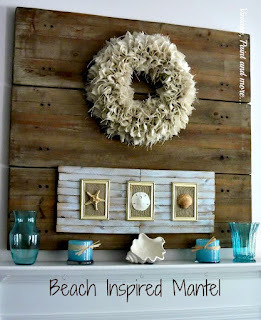 Didn't it turn out just perfect for a beachy teen hangout? What have you been up to this lazy summer week? I love to hear from you so tell me all about it in the comments below. I will be linking up to the parties posted on the Where I Party page. Please go by and visit. Check out all the great inspiration and creativeness found at these awesome parties. You and "T" did a great job. Yes the shape does make me think surf board. I love the colors you choose and it really does look like a surf board! I have a table similar to this that I want to redo and love what you did with it! 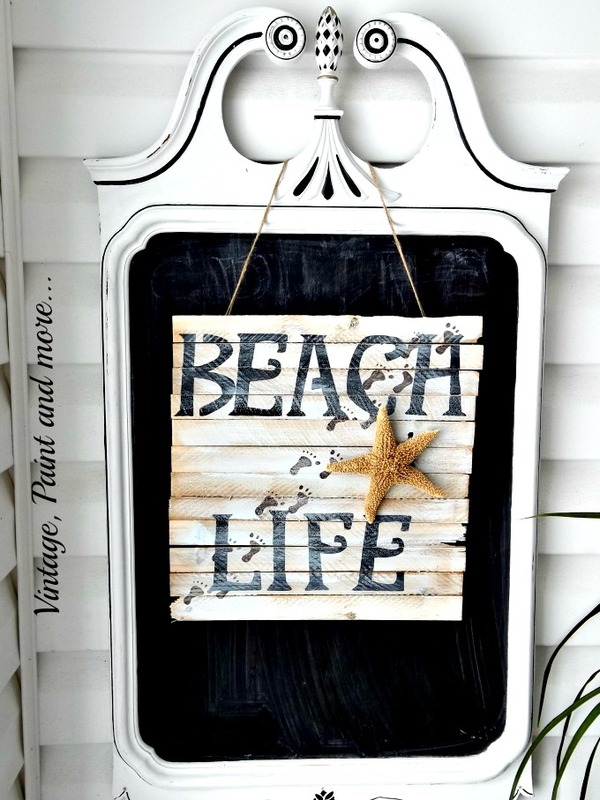 Thank you so much - the colors are definitely bright and beachy. So glad you like it. Beautiful color combo, but I am so partial to Aqua, the paint design totally hits the mark spot on for this piece! Y'all did a great job! Thank you so much Brenda. This color combo is fast becoming a favorite of mine. You did an amazing job! I love that it looks like a surf board! 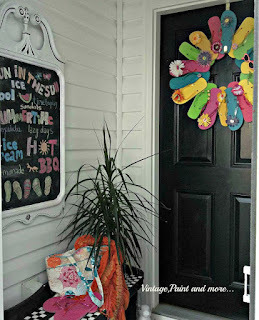 Dropping in from Pin Me Linky party, so glad I click your link! Pinned it too! Hope you have a great weekend! Thank you so much Gina. Thank you for pinning. Fabulous colors! It definitely has a summer vibe! This is really cute, I love the colors ! So unique and fun. It's also nice that your son got involved too! Thank you for sharing at the #HomeMattersParty! I does have such a beachy surfboard feel Cathy. Great redo! Thanks for sharing with SYC. HI, Cathy ~ Lovely project! Those colors are so energizing and fun! I have a hard time looking at beat up pieces and seeing the possibilities. Thanks for inspiring me! This looks exactly like a surfboard to me. 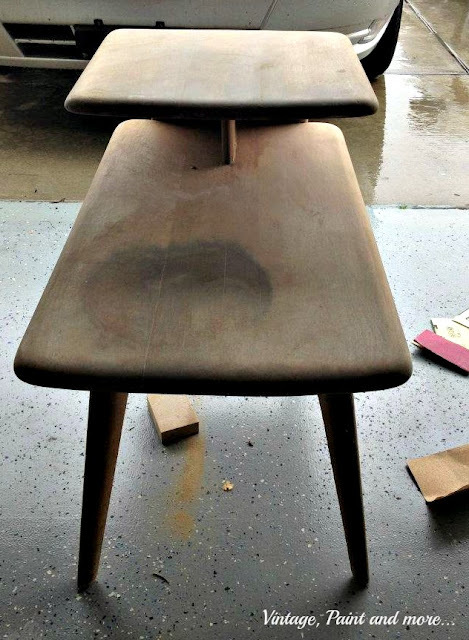 I just love the mod-style that table has, and the paint just makes it that much more fun! 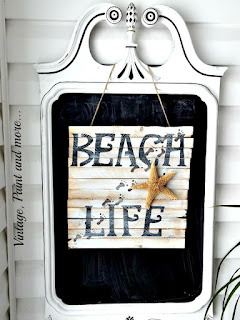 I'm choosing this as my feature for this week's Thank Goodness It's Thursday link party. I can't wait to see what you link up this week! This looks great, what a complete transformation. The colours are fab together, love it! What a fun piece and a great transformation. Thanks for sharing on Snickerdoodle Sunday. Hope to see you for the party tomorrow. Those colors are so pretty! I also really like the blue wardrobe. Great work! Thanks for sharing at Submarine Sunday!!! Great post, I love the color, very cool. This is so cute! I think the surfer theme and colors go perfectly with the mid-century design of the table. What a fun room and project! Nice to meet you on Friday's Furniture Fix. How cute! I have a similar table but it is laminate, it was in my son's room but he doesn't use it anymore! I bet he would if I painted it like this! Love it! Wow, Love it. very cute and so cool.